You are able to have one specialist, for every two base navigation you have, if you have a mate it will not help you in having room for more specialists. 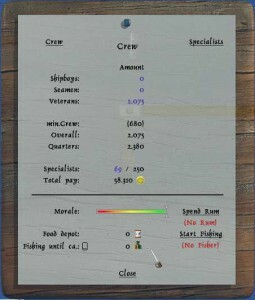 You can see how many specialists you got and how many you can have, if you use the right click menu and look under crew. If you have free space to hire specialists, then you can hire them in all cities by looking in the pub under specialists. 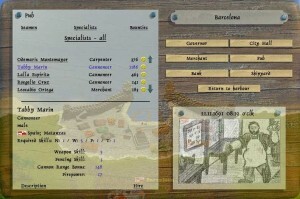 Here you will see a list of the available specialists in the city. You can click on a specialist to get a detailed description of the specialist before choosing to hire or not. 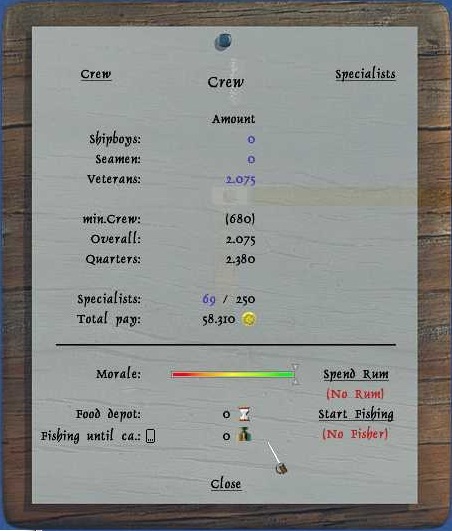 When you hired specialists you can see them in the right click menu under crew and then press specialists. Here you get a list of your specialists and if they are ticked off, they are loyal and will only leave you, if you are not able to pay them. When there is a line at them, they are not loyal and will leave you if you are rafted. 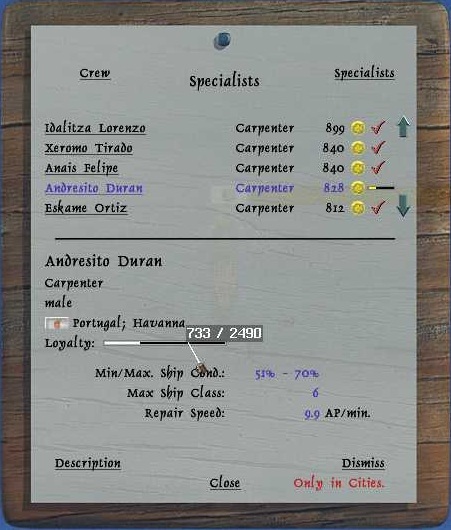 By clicking on a specialist you get a detailed description of the specialist, by holding the curser over the loyalty line you can see how many point you need for the specialist to be loyal. Specialists will gain one loyalty point every thirty second real time, where you are more than eight miles from nearest city. If you do not desire to keep a specialist anymore, it can only be dismiss when you are in a city. 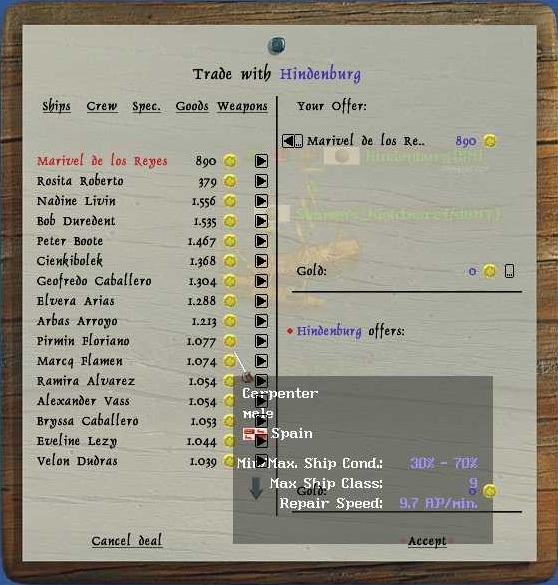 You can also trade specialists to another player, if the player has free space for more specialist, by both going into trade mode and sailing into each other and you will get a window like you see here. Here you got all the different things you can trade to another player at the top, when you press one spec. you get a list of all your specialists. You can use the arrow beside them to click them over in the Your offer box. 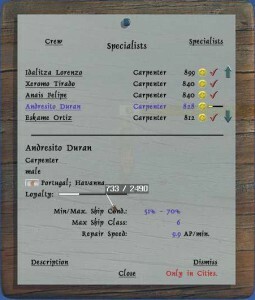 You can also hold the curser over a specialist to get details about the specialist. If someone if offering you a specialist it will be at the bottom right box. Both players has to accept to complete the trade. You can also cancel deal to stop trading with the other player. There are ten different specialists in world of pirates, which all can help you in each their different way. Some specialists you just need one of, others you need several of.